Let CarStereo.com Feature Your Store! Turning Online Shoppers into In-store Buyers! When you become a Store Member at CarStereo.com, your store listing and logo will be featured in our Local Store and Installer Directory. You'll have your own Store Profile like the one for Duke's Car Stereo of Flint, Michigan shown on the right, that can describe your store to new customers, tell them about the brand names you carry and the installation work you do, and list hours and locations (with maps) of all your stores! To View Duke's Actual Profile, Click Here. To Browse the Local Store and Installer Directory, Click Here. Local car audio retailers can now benefit from online shoppers - and who would be better to send new customers your way than CarStereo.com? Our mobile electronics resources, buyers guides and car audio community make us a prime destination for car audio shoppers. Many people looking for product information online would rather buy from a local dealer where they can get good advice, service and installation work. Get your store listed in our directory today and start turning our online shoppers into your in-store buyers! the street get listed first! Join Now! Directory and store profile is a powerful tool that thousands of online visitors use every day to find a local store in their area that carries the brands they're already searching for or to find the best professional installers and salespeople in the area. Need to sell that dead inventory, last year models or any other products in your store that you need to move at reduced prices. These classified ads are free as part of your store membership. Post your help wanted ad at CarStereo.com for free. Or even better, browse the resumes we already have on file! Your next employee could be only a few clicks away. Have buyers find you by the brand names you carry. Our store locator is integrated in to our buyers guide, classifieds, reviews, how to guide sections of the site and direct buyer to local stores. 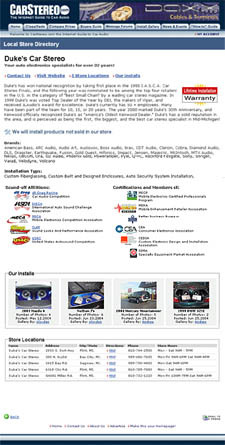 Show off your professional installers and their installation talents by listing their CarStereo.com install galleries on your store profile. Get all these features just for being a part of CarStereo.com!